Kanab, just about as far south as you can go in Southern Utah, coined that phrase for its signature slogan some years ago. With all due respect to the circus, when you spend a vacation in Kanab, you'll find their motto is more than just a play on words. There are several towns and communities in Utah that have quality outdoor recreation nearby, but Kanab just may have a monopoly on having the most. Here's but a small sampling. A short, highly scenic drive away is Zion National Park and some of the finest technical canyoneering routes found anywhere in the western United States. The Virgin River Narrows hike is the best known and a must do, a gorgeous 16 mile hike through vertical canyon walls up to 500 feet high. The Narrows requires a permit and, if camping overnight, a camp assignment. The hike is almost always in the river, thigh high with a few swims, and the right gear is a must – light hiking boots (sandals, not! ), polypro shirt and walking stick or ski poles. The constant current and slippery rocks can be challenging. You'll need to arrange a shuttle to the trailhead, about an hour from Kanab, and spot a car or pickup at the Temple of Sinawava at the end. 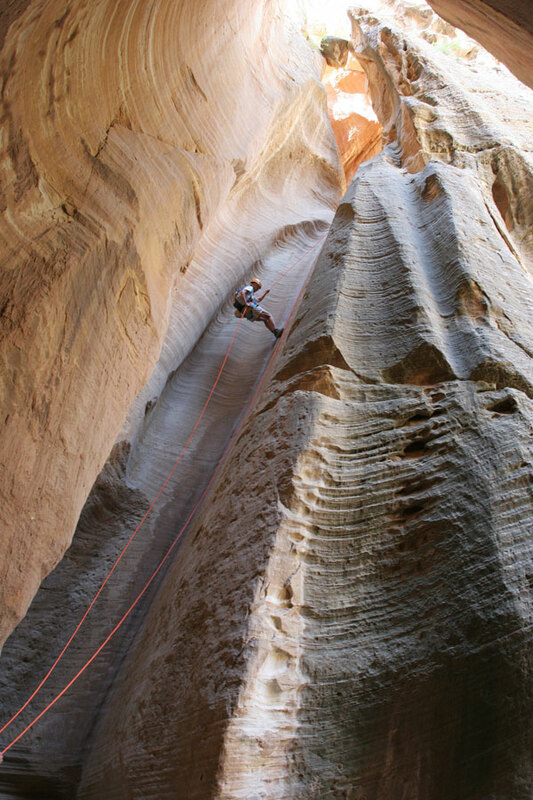 Birch Hollow is a classic canyoneering spot that is a bit of a locals' secret. Although the long version of this hike ends at Temple of Sinawava in Zion Canyon, it can be done entirely outside the park's boundaries, making it virtually unknown to most visitors. This also means you don't need to obtain a backcountry permit. Sinuous, shady, full of scrambling and rappelling joys, Birch Hollow is an utterly fantastic choice for a fully technical slot canyon experience. Closer to Kanab, if you'd like an easy stroll or bike ride, strike out for Pugh Canyon, just north of the Coral Cliffs Golf Course. A dirt track meanders along the canyon floor beside the riparian zone, where you'll see native willows and cottonwoods. A variety of birds frequent this area. As you approach the head of the canyon, the trail narrows. Scramble over a few rocks and cross the small stream to the see the drip falls about 1.6 miles from the trailhead. Return as you came, or explore a spur route that begins less than ½ - mile below the falls and leads northeast up a ridgeline. This route is steep in places as it climbs the Vermilion Cliffs. Pinion-juniper forest, slickrock, hoodoos, and sweeping views reward the adventurous. Kanab is a gateway community to the Grand Staircase Escalante National Monument. Stark, mysterious, remote, rugged, secluded, mystifying are some of the many adjectives used to describe this amazing landscape. Nearly two million acres of pristine backcountry at its finest. This vast landscape has literally hundreds upon hundreds of hikes. 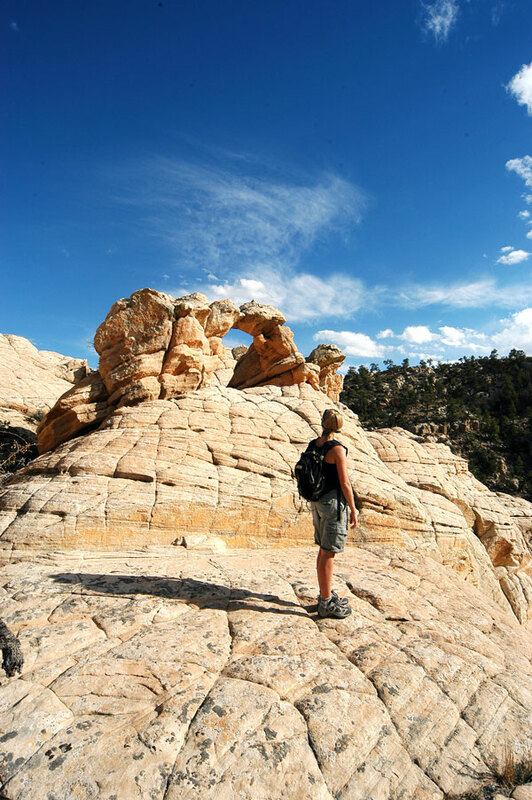 Day hikes, slot canyon hikes, water hikes, slickrock hikes, multi-day backpack hikes. You name it, GSENM has it. One very near Kanab, and not well traveled, is the Yellow Rock, Red Top and Hidden Cache Loop, a trail hike near Kanab with great photo ops culminating at an historical site with a mysterious history. This five to six hour route is strenuous with plenty of uphill sections and elevation gains and losses. Expect to do some scrambling on a steep dirt hill with loose scree. However, this rewarding hike is well worth the effort. Ten miles east of Kanab on highway 89, beautiful Johnson Canyon stretches north into the Monument. From the mouth of the canyon at the highway, adventurous road riders can pedal some 20 miles along the two-lane rural road before the pavement ends. Grades are gentle along this winding, pastoral route. The views are breathtaking as cliffs rise around you, and a wide range of birds—red-winged blackbirds, magpies, hawks, ducks, and more--can be seen along the way. Those with sharp eyes may discover a rock art panel (please enjoy the view from the shoulder as this is private property). For more information, the GSENM Headquarters is located on Center Street in Kanab. Bordering this phenomenal national monument to the south is the Paria Canyon – Vermilion Cliffs Wilderness and the amazing Coyote Buttes. Before highways, railways and pioneers, southern Utah and the lands surrounding Kanab were truly a vast wilderness. 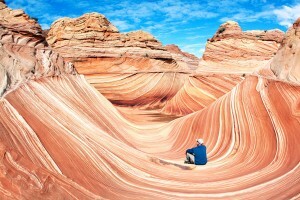 In 1984 Congress created the Paria Canyon - Vermilion Cliffs Wilderness to protect these last remaining areas. Coyote Buttes' outstanding scenery, desert wildlife, colorful history, and opportunities for primitive recreation will remain free from the influence of man and are protected in this condition for future generations. Its 112,500 acres beckon adventurers who yearn for solitude, scenic splendor, and the chance to explore one of the most beautiful geologic formations in the world. 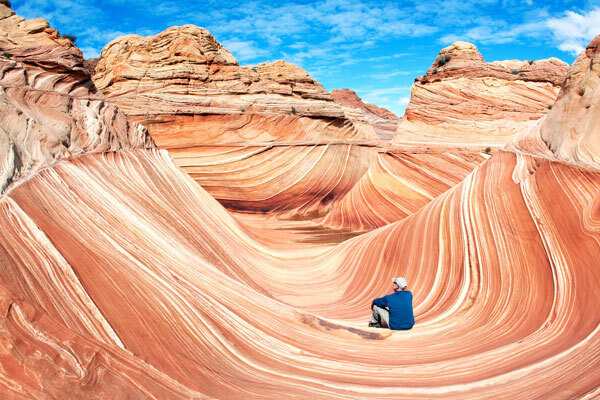 The Wave in Coyote Buttes, famed internationally, is nearby. Permits required, flash floods quite possible and carrying plenty of drinking water a must. Also in the neighborhood is the aptly named Paria Rimrock Toadstool Hoodoos hike. A camera will capture the memory. If you have always wanted to see the Grand Canyon, see it from the north rim. The one hour, 42 mile drive from Kanab up through the Kaibab Plateau winds through meadows and forests of dense ponderosa pine and mixed conifer leading to the brink of the spectacular north rim of the Grand, 1,000 feet higher than the south rim. Watch for the abundant wildlife and experience breathtaking views of the canyon. The Kiabab Plateau North Rim Parkway is not only a captivating drive for travelers but also an outstanding route for road bikers. If you're a skinny tire enthusiast looking for a leisurely ride through fir, pine, aspen forests, meadows graced with wildflowers and the awesome majesty of the Grand Canyon, cruise this byway to see why ESPN named it as one of the Top USA Biking routes. A scenic one-hour drive from Kanab through GSENM leads to Lake Powell, a huge reservoir on the Colorado River straddling the border between Utah and Arizona (most of it, along with Rainbow Bridge National Monument, is in Utah). 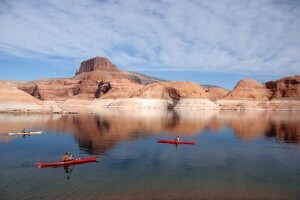 Lake Powell is the second largest man-made reservoir in the country, storing 24,322,000 acre feet of water when full. Its numerous arms and canyons create more shoreline that the entire Pacific coastline of the continental United States. Lake Powell was created by the flooding of Glen Canyon by the controversial Glen Canyon Dam, which also led to the creation of Glen Canyon National Recreation Area in 1972, a popular year-round destination. The reservoir is named for Major John Wesley Powell, a one-armed American Civil War hero who explored the river via three wooden boats in 1869. Glen Canyon NRA, managed by the National Park Service, is available to the public for recreational purposes. A map centered at the confluence of the Escalante River with the Colorado River gives a good view of the vastness of the lake. Glen Canyon National Recreation Area draws more than two million visitors annually. Recreational activities include boating, fishing, waterskiing, jet-skiing, and hiking. Prepared campgrounds can be found at each marina, but many visitors choose to rent a houseboat or bring their own camping equipment, find a secluded spot somewhere in the canyons, and make their own camp (there are no restrictions on where visitors can stay). Save some time for a wonderful side trip. Just outside Kanab is the famous Best Friends Animal Society, nestled snugly within beautiful Angel Canyon. Best Friends is home to over 2000 dogs, cats and other animals that come from shelters around the country for special care. Take a guided tour of this great facility and then take a hike in the colorful canyon. With all these quality outdoor adventures, one would think there would be an equally quality outdoor shop in Kanab. Enter Willow Canyon Outdoors! Gear, to be sure. Need a headlamp by Black Diamond or Petzl? How about a new backcountry, ultralight stove by MSR or Coleman? In the market for a top line daypack or a high tech multi-day pack? Osprey and North Face are two of the leading brands at WCO. Of course, technical clothing and footwear from Patagonia, Prana and Royal Robbins, shoes hiking boots and sandals from the best – Montrail, Keen and Chaco. And, to be the spiffiest, most sun-protected hiker in the Utah backcountry, a lid from California Hat Company. But Willow Canyon is far more than just a retail store for gear and clothing. Drop in for a cup of Sumatran organic or Guatemalan fair trade coffee or purchase a bag to go. And a bookstore as well! Guide books, natural history books and, as you would suspect, trail maps and topos of all the great Utah outdoors around Kanab. But more than anything, Willow Canyon Outdoors owners Charlie and Susan are two likeable, adventurous Utahn's by choice who know every square inch of this remarkable territory. They and WCO's staff have a world of experience of the canyons and trails, lands and wilderness here and are always willing to share. When visiting Kanab, make Willow Canyon Outdoors your first stop and the "Greatest Earth on Show" the next.